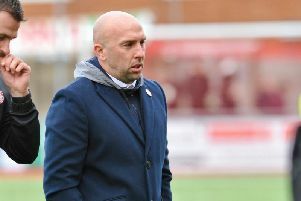 Lancing boss Mark Pulling felt Haywards Heath Town ‘proved a point’ in their thumping Sussex RUR Cup third round triumph at Culver Road last night. Recent recruit Andrew Dalhouse hit a hat-trick, Kieran Rowe and Callum Saunders both struck twice while ex-Lancers man Lewis Finney, Karly Akehurst and Alex Laing were also on the scoresheet in a crushing 10-0 triumph. Lancing were surprise winners over Haywards Heath in an FA Cup tie earlier in the season and Pulling believes they were hurt by that defeat. He said: “They came to us with a strong line-up and a point to prove. I think us beating them in the FA Cup earlier this season really hurt them and they had a point to prove. Lancing were left to regret missed opportunities as they lost 3-2 at Peacehaven & Telscombe - despite having levelled the scoreline after being two goals down. Lancers found themselves behind after goals either side of break from Tyler Scrafton gave the hosts a 2-0 lead. But the away side halved the deficit after a close-range header from Alex Bygraves gave them a lifeline. Lancing’s pressure was rewarded shortly after when Jonathan Lansdale’s superb free-kick drew Lancing level 15 minutes from time. The comeback was to be short-lived, though, as Peacehaven regained the lead almost immediately as Curtis Ford fired home the winner for the hosts. The result left manager Pulling disappointed and he was left to rue missed chances which could have changed the result. He said: “I think it’s disappointment more than anything. We deserved to get a point out of it. We didn’t play as well as they did when we had possession and that made the difference. We need to find a way to get better when we have the ball. I think people rush things when they don’t realise how much time they have rather than keeping the ball. “We are making chances and we probably made more clear chances than Peacehaven at the weekend but they scored three and we scored two. If you take the chances at the right time, we had a chance to make it 1-1 and we didn’t take it and then they went 2-0 up which then makes it a different game. Lancing, 14th after the defeat at Peacehaven, will look to get back to winning ways when they host Lingfield on Saturday. LANCING: Ovaisi; Tighe (Di Arienzo, 65), L Pittock, Bygraves, Knight; Lansdale, Langford, Saunders, Hendy (Lewis, 69); Pulling (Dudok Van Heel, 81), Daniel. Subs: Di Arienzo, Dudok Van Heel, Lewis.